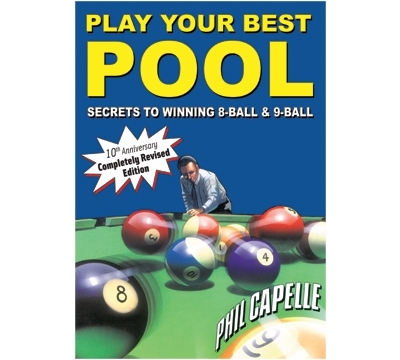 PP10 – Capelle's "Play Your Best Pool"
BCA certified instructor Phil Capelle has put together a complete course on pool that's a must for any player, from beginner to pro. This 10th Anniversary Edition has over 400 illustrations and easy-to-read text educate you on all facets of the game. Diagrams are drawn perfectly to scale with track lines, directional cues, where to stroke the cue ball and at what speed. The book begins with fundamentals and aiming techniques to help establish a rock solid foundation for your game. Other chapters cover shotmaking, how to use english, position play, how to control the cue like a pro, 8-ball and 9-ball game strategy, run-out patterns, safeties, kick shots, the break and more. Chapters on the mental game and competitive play tell you how to think like a winner and compete successfully in tournaments, money games and league play. Glossary of over 250 terms. 460 pages.